Many biological questions about N availability and the N cycle require knowledge of the abundance and identity of molecules comprising the pool of organic N. Moreover, basic knowledge of the molecular composition of the soil solution can give rise to new hypotheses via data-driven or inductive reasoning. This paper examines the composition of organic N molecules in the soil solution. Our perception of organic N in the soil solution is shaped by analytical approaches, and thus I briefly review approaches for sampling and analysis of the soil solution. I give examples of hypotheses generated by knowledge of the molecular composition of organic N and conclude by suggesting priorities for future research. Studies of the molecular composition of organic N are very much in their infancy. Amino acids, their oligomers and polymers are consistently large components of the pool of organic N. The soil solution also contains organic N compounds from at least another 12 compound classes, but almost nothing is known about their functional significance. Uncovering the role of these other compounds in the N cycle would enrich our understanding of organic N and the N cycle, and place studies of amino acids and their polymers in a broader context. Our view of organic N in the soil solution is constantly evolving (Paungfoo-Lonhienne et al. 2012). For example, one obtains a vastly different picture of organic N molecules in the soil solution in comparing the older literature with much of the past 20 years of research. Experiments from the late 19th century until the 1980s reported occurrence in soil of many different forms of organic N (e.g. protein amino acids, non-protein amino acids, nucleic acids, ureides, quaternary ammonium compounds, purine and pyrimidine bases)(Schreiner 1912; Schreiner and Skinner 1912; Lathrop 1917; Dadd et al. 1953; Aseeva et al. 1977; Aseeva et al. 1978; Schlimme and Kirse 1983) and at least some of these were known 100 years ago to be taken up by plants (e.g. see review by: Hutchinson and Miller 1912). In contrast, for the last 20 years research has focussed on bulk properties of organic N in soil solution (e.g. measurements of DON, C:N ratios), or characterising in detail specific fractions of organic N namely protein amino acids (Chapin et al. 1993; Jones and Darrah 1993; Näsholm et al. 1998; Schimel and Bennett 2004; Warren 2006) and their oligomers and polymers (Friedel and Scheller 2002; Yu et al. 2002; Farrell et al. 2011b; Hill et al. 2011; Hill et al. 2012). Describing bulk properties of organic N and characterising in detail specific fractions has provided profound insights into the functioning of organic N in soils (e.g. see reviews: Murphy et al. 2000; Chen and Xu 2008), but our understanding is limited in scope and often lacking in context. For example, studies characterising functions of amino acids are difficult to place in the broader context of organic N and the N cycle because amino acids are not the only class of organic N in soil solution (Schreiner 1912; Schreiner and Skinner 1912; Lathrop 1917; Dadd et al. 1953; Aseeva et al. 1977; Aseeva et al. 1978; Schlimme and Kirse 1983). To paraphrase a recent review on dissolved organic matter in marine systems (Mopper et al. 2007): understanding the function of dissolved organic N in soils has been hindered by methodologies in which only bulk parameters were quantified (e.g. pool of DON) or for which a significant pool of organic N resided outside our analytical window (e.g. studies that focus solely on amino acids and their polymers), with both approaches providing incomplete, incorrect or biased insights. This review begins by establishing some of the reasons that organic N in soils matters, addresses the germane question of what can be learnt by studying pools (as opposed to fluxes) before reviewing the current state of knowledge of organic N molecules in the soil solution. Our perception of what is in the soil has been shaped by the approaches used for sampling and analysis of samples, and thus I briefly review approaches for sampling and analysis of the soil solution. Examples are given where knowledge of the molecular composition of organic N can be used to generate hypotheses about the N cycle. Finally, I conclude by suggesting priorities for future research. The role of organic N in plant nutrition and the N cycle are addressed, but only in the context of hypotheses arising from knowledge of pools of organic N. Readers are referred to other papers for a broader review of the N cycle (Galloway et al. 2008; Gruber and Galloway 2008; Rennenberg et al. 2009), and organic N uptake by plants (Näsholm et al. 2009; Paungfoo-Lonhienne et al. 2012). Why does organic N in soils matter? Management of soil nitrogen is one of the keys to sustainably supplying the world with agricultural and forest products. The agricultural and forest industries are under increasing pressure to produce more products from less land. The world’s population is projected to increase by 2.5 billion over the next 43 years, from 6.7 billion to 9.2 billion (Anonymous 2006). The production of agricultural and forest products needs to keep pace not only with the rising population, but also with the increasing standards of living that are accelerating demand for plant products. One of the keys to meeting the challenge is management of nutrients, in particular nitrogen. Nitrogen is one of the nutrients most commonly managed because it is required in large amounts and commonly limits growth. Productivity is increased by applying nitrogenous fertiliser, but this causes significant environmental problems and is costly. For example, globally 85–90 million tons of nitrogenous fertilisers are applied every year to soil (Vitousek et al. 1997; Tilman 1999; Galloway et al. 2008; Gruber and Galloway 2008), which leads to remarkable increases in productivity of forests and crops (e.g. Judd et al. 1996; Smil 2000). The significant economic and environmental costs associated with fertiliser use are a strong incentive to optimise its application by learning how to strike a scientifically informed balance between too little and too much fertiliser. One of the keys to understanding N availability is low molecular weight (MW) organic molecules of the soil solution. This is because low MW organic molecules can be directly taken up by plants (Hutchinson and Miller 1912; Virtanen and Linkola 1946; Paungfoo-Lonhienne et al. 2012) and are intermediates in the breakdown of polymers to release inorganic nutrients (Fig. 1). 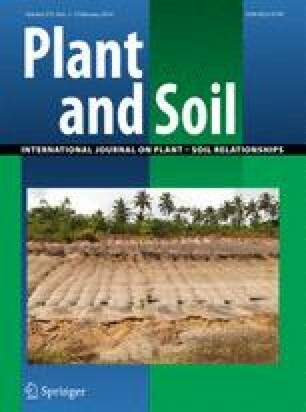 An additional practical reason for studying organic N in the soil solution is their role in the greenhouse gas budget of Earth (Gardenas et al. 2011; Knicker 2011). Soils are major players in the global C budget with a global standing stock of 1500 Pg C and 60 Pg C yr−1 exchange of C between soil and atmosphere (~ ten times larger than flux of C due to burning of fossil fuels) (Amundson 2001; Filley and Boutton 2006). Much of the enormous exchange of C between soils and atmosphere is due to cycling of low MW organic compounds in the soil solution (Schimel and Bennett 2004). For example, it was estimated that 30 % of the total CO2 respiration from soil can be attributed to turnover of low MW organic compounds (van Hees et al. 2005), many of which contain N (Knicker 2011). In addition to DON molecules having a C backbone that directly links their metabolism to the C cycle, there are a suite of less direct ways that DON can influence the C cycle (Gardenas et al. 2011; Knicker 2011). Fluxes of N are important, so what can be learnt by studying pools? The biological importance of different organic N compounds cannot be deduced solely from their concentrations in soil solution. For example, small pools of organic N monomers and oligopeptides could be interpreted as evidence that they are “unimportant” for the N cycle, but small concentrations could alternatively be seen as evidence that flux through those forms of N is rapid because they are preferred sources of N for microbes and/or plants. Similarly, small concentrations of amino sugars in the soil solution (Warren 2013c) are consistent with very rapid cycling and removal from the soil solution by high-affinity transporters in microbes (Roberts et al. 2007; Roberts and Jones 2012). In light of the challenges of interpreting what is meant by soil solution concentrations, is it worthwhile reporting or discussing concentrations of different organic N compounds? Knowledge of identity and concentration of organic N molecules is a pre-requisite for designing and interpreting experiments to quantify fluxes. Irrespective of whether the quantified flux is uptake by plants or cycling by soil microbes the common approaches for measuring fluxes of N involve addition of a certain amount of substrate (typically isotope labelled). Thus choices need to be made as to the identity and concentration of the substrate, and it would make sense if this were informed by what is in the soil solution. In many cases there will be practical reasons why it is not possible to supply substrates at the same concentration as in the soil solution (e.g. larger concentrations are required to ensure detection), but this does not negate the imperative to know what is in the soil solution. Instead the utility of knowing what is in soil solution shifts from designing realistic experiments, to its necessity for interpreting data from sometimes unrealistic experiments. For example, preliminary findings from a recent study of peptides in soil (Warren 2013a) indicate that studies investigating plant uptake of peptides (Hill et al. 2011; Soper et al. 2011) used individual peptides at concentrations that were three (Hill et al. 2011) or even six (Soper et al. 2011) orders of magnitude greater than for the same peptides in soil. Clearly, the debate about organic nutrition of plants cannot move forward until the design and interpretation of experiments is informed by knowledge of the organic N molecules in the soil solution. In the most general sense, one imperative for knowing the different molecular forms of organic N in the soil solution is that observational data can be used to generate hypotheses via inductive (or data-driven) reasoning (Kell and Oliver 2004). In this sense hypotheses are the outcome of observational data rather than its starting point. To date attempts to understand the origin, function and fate of organic N molecules have adopted reductionist hypothesis-driven means. For example, targeted measurements of concentrations and/or fluxes of selected amino acids. The logic being that one can reconstruct function of the overall system by dividing the system into its component parts (e.g. molecules or classes of molecules) and studying their function. Studies of amino acid fluxes or turnover, for example, do not capture all of the compounds amino acids are known to directly interact with (e.g. amines and fatty acids via putrefaction reactions and peptides by condensation and hydrolysis) or more complex interactions (e.g. as substrates in purine synthesis, pyrimidine interconversions). Hence, reductionist experiments on individual compound classes are unlikely to reveal the complex interactions among compounds and compound classes. In contrast, examining the diversity of organic N molecules and studying the system as a whole is more likely to reveal the complexities and interactions of organic N. Such data can provide a fertile basis for generation of hypotheses that can be tested with subsequent reductionist studies. For example, one can generate hypotheses that make sense of the observations by mapping molecules onto metabolic maps, or organising molecules based on origin (plant, fungal, bacterial) or putative function (osmolytes, primary metabolites, etc.). For at least some of the major classes of DON we have a reasonable idea of total pool size (Table 1), although limitations of techniques mean that boundaries between quantified classes are sometimes blurred (see discussion below). Soluble N in the soil solution or soil extracts can be broadly separated into organic (DON, dissolved organic N) and inorganic pools (DIN, dissolved inorganic N), with many studies reporting that the pool of DON was of a similar size or larger than DIN (Jones and Kielland 2002; Yu et al. 2002; Jones et al. 2005; Chen and Xu 2008). Studies comparing sites varying in fertility generally indicate that infertile sites have large amounts of DON and small amounts of DIN while fertile sites have large amounts of DON and large amounts of DIN (Nordin et al. 2001; Yu et al. 2003; Christou et al. 2005; Kranabetter et al. 2007). But what do we know about the molecules that comprise DON? glyco-, phospho-, lipo-, sulfo-, etc. Acid hydrolysis followed by colorimetric and fluorometric assays indicate hydrolysable amino acids (i.e. peptides and proteins) commonly account for at least 50 % of DON, whereas (free) primary amino acids are typically less than 5 % of the pool of DON (Stevenson 1982; Yu et al. 2002; Paul and Williams 2005; Christou et al. 2006)(Fig. 2). The dominance of the soil solution by oligomers and polymers of amino acids is supported by studies with 15N NMR (nuclear magnetic resonance) reporting that peptide-like and protein-like signals dominate DON (Michalzik and Matzner 1999; Kögel-Knabner 2006). In fire-affected ecosystems, 13C and 15N NMR indicates occurrence of a variety of heterocyclic structures (Knicker et al. 2005; Knicker 2007; Knicker 2011), but the low sensitivity of NMR and low N concentrations in soils makes it difficult to perform a quantitative comparisons of proteins and peptides versus heterocyclic structures. Size-based fractionation is one easy means of characterising DON. There is at least three orders of magnitude range in molecular weight of DON from the smallest organic compounds with molecular weights of less than 100 Da (e.g. ethanolamine, glycine, alanine) through to large polymers with molecular weights of 100s of kDa. Moreover, there are functional and ecological differences in DON molecules that are (directly or indirectly) related to molecular weight. For example, the < 1 kDa fraction of DON turns over rapidly (~hours) in comparison with the > 1 kDa fraction that turns over much more slowly (~days-months)(Jones et al. 2004). To date the most comprehensive study incorporating size-based fractionation reported that most DON in grasslands soils was in the > 100 kDa fraction, with the next largest fraction being < 1 kDa, with little in intermediate (1–100 kDa) fractions (Farrell et al. 2011a). A broadly similar trend was reported in a study examining dissolved organic carbon, with a larger proportion of DOC in the <1 kDa fraction than the 1–10 kDa fraction, but unfortunately no data were reported for larger size fractions (Marschner and Kalbitz 2003). The paucity of studies performing size-based fractionation precludes strong generalisations; nevertheless, it would appear that most DON is in molecules larger than 100 kDa and smaller than < 1 kDa, with a smaller proportion in 1–100 kDa fractions. Is knowing compound classes sufficient? For most compound classes we know astonishingly little about the individual compounds comprising the pool (Table 1), but do we really need detailed molecular information? In other words, is knowledge at the level of compound or molecular weight classes good enough? For many biological questions molecular information is required. The first reason is that there is molecular specificity of the transporters responsible for uptake and efflux of DON in microbes and plants. For example, plants take up different amino acids at different rates (Persson and Nasholm 2001a; Svennerstam et al. 2011). Similarly, based on experiments on mammals and microbes (Lister et al. 1995; Daniel et al. 2006) it is likely that uptake of peptides by plants and microbes varies depending on the peptide’s amino acid sequence. The second reason is that there is large variation among molecules in physico-chemical properties, even within compound and molecular weight classes. Notable among these properties are solubility and charge that affect interactions of molecules with the soil stationary phase. For example, acidic, neutral and basic amino acids diffuse through the soil at different rates (Owen and Jones 2001) and are differentially adsorbed to the soil stationary phase (Jones and Hodge 1999). Free amino acids tend to be the single most abundant class of organic N monomers in soil solution (Fig. 2). Widespread use of gas chromatography (GC) and high performance liquid chromatography (HPLC) derivatisation-based methods has led to a reasonable understanding of the patterns of primary amino acids, and to a lesser extent secondary amino acids (e.g. Read and Bajwa 1985; Abuarghub and Read 1988; Kielland 1995; Turnbull et al. 1996; Streeter et al. 2000; Andersson and Berggren 2005; Warren 2008; Werdin-Pfisterer et al. 2009; Jämtgård et al. 2010; Farrell et al. 2011a; Inselsbacher et al. 2011). It is rare for all the protein amino acids to be detected within one soil, but by combining data from multiple studies it is apparent that soil solution or soil extracts can contain all protein amino acids plus a few common non-protein amino acids such as GABA, citrulline and ornithine. Comparison of amino acid profiles among studies is generally not possible because analytical methods differ in which amino acids are quantifiable (some methods cannot quantify amides, some cannot quantify secondary amino acids, some cannot quantify cysteine or methionine) and because amino acid profiles of soil extracts (H2O or K2SO4 or KCl extracts) are not strictly comparable with amino acid profiles of soil solution (Jones and Willett 2006; Warren 2008). Nevertheless if we restrict our analysis to one sample type—soil solution—it is apparent that the dominant amino acids vary among soils. For example, in soil solution of agricultural soils the dominant amino acids were glycine, serine, alanine, aspartic acid & asparagine and glutamic acid & glutamine (Jämtgård et al. 2010), while in grasslands they were glycine, lysine and threonine (Farrell et al. 2011a) and in forest soils were serine, glutamic acid, aspartic acid, leucine (Yu et al. 2002). Variation amongst sites in amino acid profiles has also been observed in studies involving soil solutions collected across natural gradients (Yu et al. 2002) or from diverse sites (Warren 2013c). Clearly, the gross differences in amino acid profiles reported within studies (Yu et al. 2002; Warren 2013c) cannot be due to methodological differences, and thus it would appear that differences among soils are real. This contrasts with some previous studies suggesting that the composition of the soil amino acid pool is affected little by soil type (Bremner 1966; Sowden et al. 1977; Stevenson 1982). Few studies have distinguished between L- and D- enantiomers of amino acids, yet the distinction is non-trivial due to vast differences between enantiomers in patterns of uptake and metabolism (Bruckner and Westhauser 2003; Hill et al. 2011; Vranova et al. 2012). The occurrence and metabolism of D-amino acids in soils has been recently reviewed (Vranova et al. 2012), so only brief details are given here. Nineteen out of 20 protein amino acids can exist as L- or D-enantiomers (“mirror images“) because their alpha carbon molecules are bonded to four different groups (COOH, R, NH2 and H). Two of the protein amino acids (isoleucine, threonine) have two chiral carbons and thus four stereoisomers: two enantiomers (D- and L-isoleucine and D- and L-threonine) and two diastereoisomers (non-mirror image stereoisomers D- and L- allo-isoleucine and D- and L-allo-threonine). Glycine has two (indistinguishable) hydrogens attached to its alpha carbon and thus is achiral. D-amino acids are less abundant in nature than their corresponding L-enantiomers, yet D-amino acids have been reported from a range of taxa (Khoury et al. 2011) and in habitats such as soil (e.g. Amelung and Zhang 2001; Wichern et al. 2004). D-amino acids account for a significant but highly variable proportion of amino acids in hydrolysed soil (Pollock et al. 1977; Amelung and Zhang 2001; Amelung 2003; Wichern et al. 2004), but much less is known about their occurrence in the soil solution (Vranova et al. 2012). Aqueous ethanol extracts of soil from an orchard indicated that 2–17 % of amino acids were D-enantiomers (Bruckner and Westhauser 2003), while aqueous ethanol extracts of a peat bog indicated that the D/L ratio varied among the seven detected chiral amino acids (D/L between 40 and 1 % in 0–20 cm samples) and generally increased with depth (Kunnas and Jauhiainen 1993). Results of these studies need to be treated with caution because aqueous ethanol extracts a proportion of amino acids from living organisms and thus ethanol extracts do not strictly represent the soil solution (Vranova et al. 2012). Hence, a priority for future research should be determining the D/L ratio of amino acids in samples that are more representative of the soil solution (e.g. obtained by microdialysis, centrifugal extraction or lysimetry). Soil and the soil solution has long been known to contain a diversity of organic N monomers in addition to common amino acids (e.g. non-protein amino acids, nucleic acids, ureides, quaternary ammonium compounds, purine and pyrimidine bases) (e.g. Schreiner 1912; Schreiner and Skinner 1912; Lathrop 1917; Aseeva et al. 1977; Aseeva et al. 1978; Schlimme and Kirse 1983). More recent studies using 15N NMR have indicated occurrence of a wealth of heterocyclic structures in fire-affected soils (Knicker et al. 2005; Knicker 2007; Knicker 2011). Unfortunately older studies were generally limited in scope presenting data for a handful of molecules and were qualitative or (at best) semi-quantitative, while more recent 15N NMR studies generally did not identify specific molecules but rather presence of functional groups. As a consequence it is not possible to draw together a cohesive picture of abundances and overall patterns from much of the literature. What one can do, however, is to piece together data from quantitative studies of particular compound classes (e.g. amino sugars: Roberts et al. 2007) with recent studies that used mass spectrometry to obtain a broader picture of organic N monomers (Warren 2013b; Warren 2013c). Among seven soils protein amino acids were found to account for 52–88 % of organic N monomers (Warren 2013b; Warren 2013c), in broad agreement with views that amino acids are the major pool of organic N monomers in the soil solution (Jones et al. 2005). However, N-containing organic monomers from an additional 11 compound classes were quantified with the most abundant other compound classes being quaternary ammonium compounds and non-protein amino acids (Fig. 2). Moreover, only in one of seven soils did protein amino acids comprise all ten of the most abundant molecules. The more common situation was for the group of ten most abundant molecules to include quaternary ammonium compounds (e.g. betaine, hercynine), or non-protein amino acids (e.g. theanine) or pyrimidines (ectoine and hydroxyectoine) or azoles (urocanic acid) or alkylamines (triethanolamine). Amino sugars have received less attention than amino acids, despite studies suggesting that amino sugars account for 5–12 % of total soil organic N (Stevenson 1983; Jorgensen and Richter 1992; Knicker 2011) and are cycled very rapidly in soils (Roberts et al. 2007; Roberts and Jones 2012). Part of the reason for the relative neglect of amino sugars is that concentrations in the soil solution tend to be rather small (individual amino sugars < 150 nM: Roberts et al. 2007) and make a much smaller contribution to DON than amino acids (Roberts et al. 2007; Warren 2013c). To date research on amino sugars in the soil solution has focussed on hexosamines such as glucosamine, yet it is probable that soil solution contains a far richer assemblage of amino sugars and molecules related to amino sugars (Table 1). The amino sugars in soil probably originate from breakdown of cell walls of plants, archea, bacteria and fungi (Roberts et al. 2007; Roberts and Jones 2012). Hence, soil solution could well contain other sugar amines derived from cell walls of archea, bacteria and fungi such as N-acetylglucosamine, N-acetylmuramic acid, N-acetyltalosaminuronic acid and their corresponding non-acetylated forms. Two independent techniques, hydrolysis (Yu et al. 2002; Andersson and Berggren 2005; Farrell et al. 2011b; Hill et al. 2011; Hill et al. 2012) and 15N NMR (Michalzik and Matzner 1999; Kögel-Knabner 2006) suggest that DON is dominated by oligomers and polymers of amino acids (i.e. peptides and proteins, see Fig. 2). For example, in a series of forest soils 48 to 74 % of DON could be accounted for by compounds that hydrolysed to amino acids (Yu et al. 2002). To date the focus has been on simple peptides and proteins (i.e. polymers of amino acids), but it is probable that soil solution contains other N-containing oligomers and polymers. For example, glyco-peptides are common constituents of cell walls of plants and bacteria and thus probably occur in the soil solution. More generally, the soil probably contains a diversity of conjugated or modified peptides and proteins (e.g. glyco-, phospho-, lipo-, chromo- peptides and proteins) given that such modifications of proteins and peptides are common (Mann and Jensen 2003; Blom et al. 2004; Khoury et al. 2011). Conjugation can have profound effects on physico-chemical properties and metabolism of peptides and proteins, and thus a priority for future research should be to quantify separately conjugated and simple forms and investigate differences in metabolism (e.g. uptake by plants and microbes). There have been few measurements of molecular forms of peptides and proteins, despite the recognition that they dominate DON and may make a significant contribution to ecosystem N cycling and plant nutrition (Yu et al. 2002; Andersson and Berggren 2005; Rentsch et al. 2007; Paungfoo-Lonhienne et al. 2008; Hill et al. 2011; Soper et al. 2011; Hill et al. 2012; Paungfoo-Lonhienne et al. 2012). The first (and apparently only) study so far to profile peptides in the soil solution reported that the soil solution contained at least several hundred peptides < 1 kDa (Warren 2013a). The large number of peptides meant that the pool of peptide-N was spread among many molecules. Hence, the most abundant molecules were amino acids and quaternary ammonium compounds with individual concentrations of 0.5–1.0 μmol L−1, whereas approximate concentrations of the most abundant peptides were 0.01–0.05 μmol L−1. Recent studies suggest that chirality may have a large effect on uptake of peptides from soil (Hill et al. 2011; Hill et al. 2012), yet there are currently no data on chirality of peptides (or proteins) in the soil solution and the situation is enormously complex. For example, if we ignore chirality there are 3.3684 × 106 possible amino acid sequences for di- to penta-peptides (Payne et al. 2000). The broader literature on peptide transporters indicates that uptake parameters vary among the different sequence combinations of D- and L- amino acids (e.g. di-peptides that are LL, DD, DL, LD)(Lister et al. 1995). Thus the complexity arising from variation in amino acid sequence is multiplied by the occurrence of stereoisomers. The common methods for characterising DON involve sub-sampling the soil solution (centrifugation, microfiltration via suction lysimeters), or dialysing analytes from the soil solution (microdialysis), or extracting bulk soil with aqueous solutions. A germane question to ask is whether the different sampling/extraction approaches yield samples that reflect in situ concentrations. One way to evaluate sampling/extraction approaches would be to compare them with concentrations measured directly in situ, for example, by mass spectrometry surface analysis methods (see below). Comparisons such as these are yet to be made, and thus we are left in the unsatisfactory position of knowing results differ significantly among sampling/extraction approaches (e.g. Jones and Willett 2006; Inselsbacher et al. 2011) but cannot objectively say which methods yield results closest to in situ concentrations. Bearing this important caveat in mind, what follows is a brief discussion of the more common methods to sample organic N from the soil solution. Soil biologists have long used microfiltration-based suction lysimeters for sampling of the soil solution and characterisation of DON (Yu et al. 2002; Jämtgård et al. 2007; Inselsbacher et al. 2011). A microfiltration probe (commonly referred to as a suction lysimeter, porous cup or porous probe) contains a hydrophilic semi-permeable membrane that is buried in the ground and is connected to the surface by vacuum tubing. Application of a partial vacuum leads to mass flow of soil solution (the filtrate) into the probe lumen and a collection device (Fig. 3). In general, lysimeters involve filtration through small pores (< 0.1 or 0.2 μm) so as to exclude microbes and thus the filtrate should be sterile and not suffer rapid mineralisation after collection. The amount of disturbance of the soil varies depending on the size of the microfiltration probe and rate at which soil solution is withdrawn. Ideally one would use the smallest possible probe (e.g. <1 mm diameter probes used in neuroscience) and withdraw soil solution slowly so as not to affect the external milieu. In practice, however, the microfiltration probes commonly used by soil biologists tend to be larger (e.g. the smallest commercially available “micro” probe is 1 mm diameter and most probes are > > 2.5 mm) and involve rapid depletion of the external milieu due to removal of large volumes of soil solution (100s of μL to mL). Microfiltration is typically regarded as providing representative samples because it is essentially a size-based filtration process (Korf et al. 2010), but samples of soil solution obtained via microfiltration can be biased for at least two reasons. First, filtrates obtained from soil are probably biased towards the largest liquid-filled pores because pores tend to empty from largest to smallest as a function of trends in water potential (Miro et al. 2010). The second reason is that some molecules can be adsorbed to microfiltration membranes (e.g. up to 50 % of an artificial DOC solution was adsorbed by ceramic suction cups, Wessel-Bothe et al. 2000), and there is some selectivity in terms of the rate at which different molecules cross the membrane. Adsorption and relative permeability is a function of the materials membranes are made from (borosilicate, silicon carbide, quartz/teflon, ceramic, polyethersulfone, regenerated cellulose) and varies among molecules (e.g. as a function of charge or hydrophilicity) (Guggenberger and Zech 1992; Murphy et al. 2000; Wessel-Bothe et al. 2000; Huinink et al. 2010; Korf et al. 2010). Hence, absolute quantification requires testing of recovery of target molecules. A major limitation of microfiltration is that soils must be moist so as to obtain soil solution (e.g. > 70 % of maximum water holding capacity: Miro et al. 2010). Centrifugal extraction of soil solution (Davies and Davies 1963; Monreal and Mcgill 1985; Zabowski 1989) operates via a similar principle as microfiltration: soil solution is extracted from soil by application of a pressure differential across a semi-permeable membrane. Centrifugal extraction, like microfiltration, is complicated by differences among molecules in relative permeability across the semi-permeable membrane and is probably biased towards the easily extracted fraction of soil solution (i.e. largest water-filled pores). A major drawback of centrifugal extraction is that it involves disruption of soil structure and delays in-between soil collection and extraction. Metabolism of analytes can occur at any of the steps in between sample collection and extraction, and thus concentrations measured in centrifugal extracts may deviate from in situ concentrations. Microdialysis has recently been used as a tool to monitor in situ diffusive flux of amino acids in soils (Inselsbacher et al. 2011; Inselsbacher and Näsholm 2012), which followed on from earlier work on microdialysis in soil (Miro and Frenzel 2005; Sulyok et al. 2005) and several decades experience by the neuroscience community (e.g. as reviewed by: Korf et al. 2010). Microdialysis involves insertion of a small probe into the soil and subsequent perfusion of the probe lumen with a perfusate solution (Fig. 3). The probe contains a semi-permeable membrane that allows small molecules to penetrate the membrane down a concentration gradient (Miro and Frenzel 2005). The outflow from the probe (dialysate) contains the analytes of interest and can subsequently be analysed (Korf et al. 2010). As is the case for microfiltration, relative permeability of the microdialysis membrane varies among molecules, and thus the material of the membrane must be chosen wisely and various procedures used to derive the tissue concentration of an analyte from its concentration in the dialysate (i.e. calibration or calculation of relative recovery, e.g. Bungay et al. 1990; Menacherry et al. 1992; Bouw and Hammarlund-Udenaes 1998). One advantage of microdialysis over microfiltration is that microdialysis can obtain samples from dryer soil than microfiltration (minimum of 50 % versus 70 % of maximum water-holding capacity: Miro et al. 2010). To place this in context, in most soils the notional permanent wilting point (−1.5 MPa) equates to considerably less than the 50 % of maximum water holding capacity stated as the lower limit of operation for microdialysis. Hence, for a drying soil microdialysis will stop working well before plants stop extracting water and nutrients. The Achilles heel of microdialysis is that chemical composition of the perfusate and sample matrix (i.e. soil) affect microdialysis such that dialysate concentrations of ionic compounds may vary for the same concentration of analyte (Miro and Frenzel 2004; Miro and Frenzel 2005). This complication arises because of differences of migration rates between the target ionic compound and the concomitant co-ions. Solutions include matching perfusate composition with that of the sample matrix and/or using perfusates containing substantial concentrations of inorganic salts. For neurochemical and clinical applications choice of perfusate composition is comparatively simple because the inorganic salt composition and ionic strength of the sample matrix is rather invariant; hence, the common practice is to use perfusates that are isotonic solutions of inorganic salts. Recent papers on soil microdialysis used perfusate solutions consisting solely of water (Inselsbacher et al. 2011; Inselsbacher and Näsholm 2012), which would tend to bias microdialysis towards uncharged compounds because their mass transfer is unaffected by co-ions (Miro and Frenzel 2004; Miro and Frenzel 2005). The relative permeability of the probe towards different compounds can in principle be accounted for by calibration, but calibrations will be skewed if inorganic salt composition or ionic strength of the sample matrix is different to that used for calibration. This poses a major challenge for use of microdialysis with soil given that the inorganic salt composition of soil solution varies enormously among soils and is highly dynamic. Additional validation of microdialysis is required to determine if perfusate composition needs to be modified and calibrations of relative recovery (for 10s to 100 s of compounds) performed whenever there are changes in inorganic salt composition or ionic strength of the soil solution being probed. Aqueous extracts are an easy means of obtaining a large amount of sample, and are the only technique that works reliably in dry soils. The main problems with soil extracts is that they involve disturbance of the soil, delays in-between collection and extraction, and extracts are “polluted” by a variable (and generally unknown) contribution of compounds extracted from lysed microbial and plant cells. Mineralization during extraction probably means that extracts overestimate concentrations of inorganic N and underestimate organic N (Rousk and Jones 2010). Additional complications are that the profile and amount of metabolites extracted are strongly dependent on the type of extractant (e.g. water versus 1 M KCl, Warren and Taranto 2010), shaking time and ratio of soil to extractant (Jones and Willett 2006). The limitations of soil extracts mean that they are unlikely to be representative of the in situ milieu, but yield data that can be compared within studies and (with rigorous control of extraction conditions) among studies. Moreover, extracts may be the only viable option in some situations such as in dry soil or where a large volume of sample is required for subsequent analyses. Our views of DON are shaped and limited by the analytical approaches used. Thus it is necessary to evaluate critically the methods used for analysing DON and suggest what might be fruitful approaches to pursue in the future. To review all of the methods used to explore DON is impractical, so instead I focus on those that are used most commonly and/or have the most potential for future studies. I begin by considering methods for quantifying broad pools of DON, and then move on to consider methods for uncovering the molecular nature of DON. DON comprises multiple compound classes (Schreiner 1912; Schreiner and Skinner 1912; Lathrop 1917; Dadd et al. 1953; Aseeva et al. 1977; Aseeva et al. 1978; Schlimme and Kirse 1983; Warren 2013b; Warren 2013c) and thus one way to characterise DON is to quantify total pools of different compound classes. To date the most common of these measurements has been of the total pool of amino acids estimated from ninhydrin (colourimetric) or o-phthaldialdehyde (fluorometric) assays (Jones et al. 2002). An important caveat with ninhydrin and o-phthaldialdehyde assays is that they are neither completely specific nor comprehensive for amino acids. The assays are based on the reaction of ninhydrin with primary and secondary amines to produce coloured derivatives (λmax = 570 nm for primary amines and 440 nm for secondary amines), and reaction of o-phthaldialdehyde with primary amines and sulfhydryls to produce a fluorescent derivative. In practice secondary amines such as proline (which can be abundant in many soils: Warren 2013c) are generally not captured by the ninhydrin method because measurements are typically made only at 570 nm. In both assays the degree of colour or fluorescence development depends on the individual amino acid (Jones et al. 2002) and both assays suffer from interferences (e.g. of ninhydrin with ammonium and to a lesser extent peptides and proteins; and o-phthaldialdehyde with sulfhydryls). Modifications of the classical methods have been published that eliminate some interference problems (e.g. carbohydrate interference with ninhydrin: Magné and Larher 1992), yet these methods do not seem to be widely used. A consequence of these limitations is that the assays can be quantitative, but only after extensive testing and correction for cross-reactivity. For many studies it is unclear if these tests have been performed and consequently data should be interpreted cautiously. Colorimetric assays exist for other compound classes such as amino sugars (Reissig et al. 1955), purines (Schlimme and Kirse 1983) and quaternary ammonium compounds (Stumpf 1984) but do not seem to have been widely used for soil extracts or soil solution. Colourimetric and fluorimetric assays have also been used to estimate total pool of proteins, but the weight of evidence suggests that these assays are unreliable when used with crude samples of soil solution due to interferences and cross-reactivity issues (Whiffen et al. 2007; Roberts and Jones 2008). The contribution of peptides and proteins to DON is commonly estimated by hydrolysing samples and then measuring released amino acids. Hydrolysis with 6 M hydrochloric acid is the most popular method, despite a litany of problems: poor recoveries of Trp, Cys, Ser, and Thr due to partial decomposition; poor recovery of Ile and Val due to slow cleaving of peptide bonds; poor recovery of Met due to oxidation; and hydrolysis of Asn and Gln to Asp and Glu (Rutherford and Gilani 2009). Alternatives such as hydrolysis with methanesulfonic acid have been used with soils and offer advantages and disadvantages over the more usual 6 M hydrochloric acid (Martens and Loeffelmann 2003). In reality there is no best method and it seems unlikely that such a “silver bullet” will arise given that the commonly-used hydrolysis procedures have changed little in 50 years despite large numbers of papers being published on the topic (Rutherford and Gilani 2009). The most important aspect of hydrolysis is knowing limitations of the approach and implications for data interpretation. In terms of knowing the fraction of DON in peptides and proteins, results of hydrolysis have a wide error margin (maybe ± 10–20 %) due to poor recoveries of several amino acids and because Asp and Glu quantified in the hydrolysate are the sum of the acid and amide (that differ by 1 N). Moreover, the products of hydrolysis are usually interpreted in terms of simple peptides and proteins, yet in reality are probably a mix of simple and conjugated forms (e.g. glyco-, phospho-, lipo- peptides & proteins). One way to partially characterise DON is based on molecular weight. The simplest approach is to fractionate samples with membranes of differing molecular weight cut-offs, and perform subsequent measurements on the fractionated sample (e.g. Farrell et al. 2011a). Automated on-line systems for size based separations do not appear to have been used for analysis of soil solution, but could provide some useful information. For example, it is rather commonplace for marine and freshwater dissolved organic matter to be characterised with on-line systems involving size exclusion chromatography coupled with multiple on-line detectors (ultra-violet, fluorescence and dissolved organic carbon) (Her et al. 2003). The number and diversity of organic N molecules in the soil solution poses a considerable analytical challenge. For example, recent studies with capillary electrophoresis-mass spectrometry (CE-MS) suggested there were at least 100 monomeric DON compounds and several hundred small peptides (Warren 2013b; Warren 2013c; Warren 2013a) while direct infusion ultra-high resolution mass spectrometry of aqueous extracts resolved thousands of signals from organic compounds (Ohno et al. 2010). The enormous range in size, solubility, polarity and volatility means that it is not possible to capture the molecular diversity of DON with one technique. For biological samples the problem of extreme chemical diversity is rather commonplace and commonly requires use of multiple complementary analytical platforms to obtain a broad overall picture (Mashego et al. 2007; Saito et al. 2010; Patti et al. 2012; Kuehnbaum and Britz-McKibbin 2013). In deciding how one might analyse DON in soil solution it is worth thinking about the biggest hurdles to overcome. For at least three reasons the biggest challenge for analysing DON in soil solution is detection and identification. Few DON compounds have concentrations > 1 μM and thus detection limits need to be much better than 1 μM to be useful for DON in soil solution. Detection needs to be able to cope with complex mixtures containing hundreds to thousands of individual compounds. The large number of compounds in DON means that there will be multiple overlapping peaks if samples are separated using common analytical separations such as GC, HPLC or CE. Non-selective (“universal”) detectors such as ultraviolet–visible detector (UV–vis), evaporative light-scattering detector (ELSD) and flame ionization detector (FID) can visualise peaks but provide little structural information and thus are unable to distinguish overlapping peaks and cope with complex mixtures. Many DON compounds in the soil solution are unknowns. An ideal analytical platform should involve detection methods that can aid with ID (i.e. yield structural information). The two main detection systems capable of ID and quantification of complex mixtures are nuclear magnetic resonance spectroscopy (NMR) and mass spectrometry (MS). Both are considered briefly below. Nuclear magnetic resonance spectroscopy is the primary analytical tool for determining structure of molecules, and can also be used for ID and quantification of small molecules in complex mixtures (Nicholson et al. 1999; Fan et al. 2001; Dunn et al. 2011; Kuehnbaum and Britz-McKibbin 2013). The most common type of NMR used in studies on DON has been solid-state 15N or 13C NMR, which has provided information about presence and relative abundance of particular functional groups of N (e.g. Knicker et al. 1995; Knicker and Ludemann 1995; Knicker et al. 1996; Schmidt et al. 1997; Chen and Xu 2008) rather than ID of individual compounds. One limitation of NMR for characterising DON in soil solution is that NMR has limited concentration sensitivity. Choice of instrumental approach is important because solid-state NMR tends to be more sensitive than liquid state NMR, while 13C is more sensitive than 15N (Mopper et al. 2007). In any case, the problem of poor detection limits can be partially overcome by pre-concentration of samples (e.g. by freeze drying or solid-phase extraction), isotope labelling and longer acquisition times. Future applications of NMR are likely to involve advanced multi-dimensional techniques and spin editing, as has been suggested for marine dissolved organic matter (Mopper et al. 2007; Hertkorn et al. 2013). Mass spectrometry is in general more sensitive than NMR, but the different types of mass spectrometers and various ways they can be used lead to great differences in detection limits from better than 1 nM to low μM (Lu et al. 2008; Psychogios et al. 2011; Warren 2013b). Mass spectrometers can be used as stand-alone instruments whereby the sample is infused directly into the mass spectrometer (commonly known as direct infusion or flow injection mass spectrometry). Direct-infusion mass spectrometry has been widely used for high-throughput phenotyping of plant and animal samples (Dunn et al. 2011; Draper et al. 2013), but has seen infrequent use with soil. The biggest challenge with direct infusion mass spectrometry is resolving individual compounds within complex mixtures containing several thousand individual compounds, including > 60 peaks per nominal mass (Koch et al. 2005; Purcell et al. 2006; Ohno et al. 2010). Low-resolution mass spectrometers (e.g. ion trap, quadrupole and triple quadrupole) can resolve ions differing in nominal mass (e.g. glutamine with nominal mass 146 Da from glutamate with nominal mass 147 Da) whereas ions with same nominal mass but differing exact mass (e.g. glutamine with exact mass 146.06859 Da versus lysine with exact mass 146.10498 Da) are not resolved from one another and appear as a single peak. Consequently, with direct infusion of complex samples, low-resolution mass spectrometers have limited ability to resolve and identify individual compounds– unless additional structural information is obtained by, for example, obtaining MS2 and MS3 spectra (Koulman et al. 2007). In contrast, high and ultra-high resolution mass spectrometers (e.g. Fourier transform-ion cyclotron resonance FT-ICR, and Orbitrap) can resolve ions differing in mass by less than 0.001 Da even with extremely complex spectra (Kaiser et al. 2011). Moreover, high and ultra-high resolution mass spectrometers yield accurate molecular weight and isotope pattern information that can be used to predict the elemental compositions (molecular formulas) of metabolites as clues for their structural elucidation. Direct infusion experiments with high or ultra-high resolution mass spectrometers have provided enormous detail on the composition of thousands of individual compounds in dissolved organic matter (DOM) from freshwater and marine systems (Stenson et al. 2003; Kujawinski et al. 2004; Koch et al. 2005; Hertkorn et al. 2013). In one of the few applications of direct infusion mass spectrometry on soil, Ohno and colleagues (2010) used direct infusion with ultra-high resolution mass spectrometry of plant and soil extracts to discover molecular signals (“biomarkers”) for different types of soil and plant-derived biomass. Mass spectrometry surface analysis methods such as DESI (desorption electrospray ionization)(Takáts et al. 2004) hold great promise as tools for direct chemical analysis of soil. In DESI an electrically charged mist is directed at the sample surface, analytes are desorbed and ions travel into the mass spectrometer. DESI and related methods permit the direct chemical analysis of surfaces at high spatial and temporal resolution, require no sample preparation, operate in ambient air rather than vacuum and can be applied to live samples (Takáts et al. 2005). Mass spectrometry surface analysis methods are yet to be applied to soil, but a miniaturised version of DESI (nanoDESI) was recently used for metabolic profiling of living microbial colonies (Moree et al. 2012; Watrous et al. 2012) and can be applied to various other biological surfaces (e.g. see recent review of microbiological applications: Watrous and Dorrestein 2011). Some method development will be required to adapt surface analysis methods to soil, but the effort should be worthwhile given the potential reward is a method that meets many of the criteria of an ideal method: direct analysis, minimally invasive, high spatial and temporal resolution. Where the aim is to ID and quantify as many compounds as possible in complex mixtures the most promising approach is chromatographic or electrophoretic separations hyphenated with mass spectrometry (Kuehnbaum and Britz-McKibbin 2013). In this approach crude sample is first separated by gas chromatography (GC), high performance liquid chromatography (HPLC) or capillary electrophoresis (CE) with the separated sample components subsequently entering a mass spectrometer. Major advantages of chromatographic or electrophoretic separations compared with direct infusion are: a) ions with the same nominal mass but different exact mass, which in direct infusion experiments with low-resolution mass spectrometers cannot be resolved, can often be separated by electrophoresis or chromatography; and b) structural isomers, which confound interpretation on any mass spectrometer, can often be separated by electrophoresis or chromatography. GC-MS is the most mature hyphenated separation technique and has found widespread use for complex samples of biological origin (Roessner et al. 2000; Persson and Nasholm 2001b; Schauer et al. 2005; Wishart et al. 2009). The Achilles heel of GC is that analytes must be volatile to be chromatographed, which in practice means that GC-MS is limited to small molecules that are volatile or can be made volatile by derivatizing. However, many organic N molecules (e.g. quaternary ammonium compounds, oligomers and polymers) cannot be derivatized using common reagents or are degraded during passage through the hot injection port and column or have too low a vapour pressure (Kaspar et al. 2009). Hence, GC-MS is limited in scope to a sub-set of monomeric DON compounds (amino acids, some amines). Mass spectrometry hyphenated with HPLC (LC-MS) or CE (CE-MS) is ideal for quantifying and identifying compounds comprising DON. To date LC-MS has not been applied to analysis of DON in soil solution, despite successful use in other biological systems for similarly complex samples. A useful starting point for LC-MS of small (< 1 kDa) molecules would be to use a combination of hydrophilic interaction liquid chromatography (HILIC) and reversed-phase separations to obtain a broad coverage of hydrophilic and hydrophobic molecules (Gika et al. 2008; Chen et al. 2012; Zhang et al. 2012). Recently CE-MS was used successfully for ID and quantification of DON monomers and small peptides in the soil solution (Warren 2013b; Warren 2013c; Warren 2013a). The CE-MS method was somewhat selective for DON because it separated those molecules that were cations at low pH, which in the case of organic molecules is typically associated with the presence of N (or less commonly other elements such as S or Cl). The CE-MS method could not separate DON molecules that were neutral or anionic at low pH such as N-acetylglucosamine and nucleoside mono- di- and tri-phosphates. However, these molecules are in principle separable using CE-MS approaches for anions (Soga et al. 2009; Kok et al. 2011). The reality is that there is no single best analytical platform for DON in soil solution, and the best solution is to use multiple orthogonal separation and detection schemes. One aspect that has not been addressed here, yet arguably comes closest to being a “silver bullet” is use of NMR as a chromatographic detector or parallel collection of mass spectrometry and NMR data. In reality mass spectrometry yields enough structural information for ID of linear macromolecules with a limited number of building blocks (e.g. peptides: Hunt et al. 1986), but is often incapable of providing sufficient information for ID of general unknowns (Sturm and Seger 2012). LC–NMR combines efficient HPLC separation of crude mixtures with the information rich spectroscopic method NMR and effectively fills the sensitivity gap between highly sensitive LC–MS and the (typically) poor sensitivity of off-line NMR spectroscopy. LC-NMR and LC-SPE-NMR technologies are nowadays reasonably well established (Simpson et al. 2004; Godejohann 2010; Sturm and Seger 2012), yet the technology is not widespread and is yet to be applied to soil solution. An additional development that may well become the gold standard is the so-called “total analysis system” that separates samples by HPLC and then collects in parallel information rich NMR and MS signals (i.e. LC-SPE-NMR-MS: Schlotterbeck and Ceccarelli 2009). Knowledge of the molecular composition of DON provides a solid foundation for generation of hypotheses that can be tested in future studies. What are some of the open questions or hypotheses arising from a broader and more inclusive understanding of DON? Are the large amounts of non-amino acid monomers (e.g. ectoine, hydroxyectoine and quaternary ammonium compounds such as betaine and hercynine, Fig. 2) important for plant N nutrition? These molecules are suggested to be osmolytes of microbial and/or plant origin (Lippert and Galinski 1992; Hasegawa et al. 2000; Wood et al. 2001), but almost nothing is known about their cycling. It is likely that cycling of osmolytes would contrast with protein amino acids given their differing origins (de novo synthesis of osmolytes versus hydrolysis of proteins) and functions. It is known that bacteria can take up pre-formed osmolytes from the external medium (Welsh 2000; Wood et al. 2001) but we do not know if plants are also able to take up non-amino acid monomers and how this compares to rates of uptake of amino acids? Related questions that arise are whether re-wetting of dry soils lead to a pulse of osmolytes into the external medium due to osmotic de-shocking of microbes, and are these osmolytes rapidly taken up by plants or microbes? Questions about the significance of peptides for plant nutrition arise from the observation that the pool of peptides in soil is large, but is spread among many compounds and thus individual concentrations are low. Little is known about the molecular specificity and kinetics of peptide uptake by plants, but this is critical for interpreting the significance of peptides in soil. At present we do not know whether individual peptides compete for uptake, or are taken up independently. From the plant’s perspective is there a single large pool of peptides, or individual peptides present at low concentrations? If, as has been shown for mammals and microbes (Lister et al. 1995; Daniel et al. 2006), affinity varies as a function of amino acid sequence, do differences in affinity correlate with concentrations of individual peptides in the soil solution? That organic N is important and should be studied is beyond contention, but by focusing on amino acids and their polymers have we lost focus of the big picture? One of the most widely heard justifications for studying organic N is that nitrate and ammonium constitute only a small proportion of bio-available soluble N, and thus focusing on nitrate and ammonium yields a biased view of the N cycle. Examining amino acids and their polymers is a step in the right direction in terms of obtaining a more realistic view of the N cycle. However, the soil solution contains many other classes of organic N. For example, the presence of heterocyclics and osmolytes provides clues as to soil history and function (i.e. fire and abiotic stresses), and direct evidence of a substantial fraction of N being diverted away from amino acids and their polymers. Priorities for future research include determining the broader implications of heterocyclics and osmolytes for the N cycle. Studies of these and other classes of organic N are necessary not just because they are interesting in their own right, but to place studies of amino acids and their polymers in a broader context. Quantification and characterisation of organic N may at first seem like an insurmountable task, but is achievable if the task is broken down into smaller pieces and prioritised. One way to prioritise and fast-track improved understanding is by examining first those classes of molecules and/or processes that are either completely unknown or putatively important for the N cycle. Determining stereochemistry of amino acids and peptides in the soil solution should be priorities for future research. Measurements are necessary because experimental evidence indicates large differences in metabolism of D- and L-enantiomers of amino acids and peptides, yet we do not know what is in the soil solution. A priority for future research is determining the diversity of oligomers and polymers in the soil solution. Oligomers and polymers are generally interpreted as simple linear sequences of amino acids, yet it is probable that other classes such as phospho- and glyco-peptides are abundant. It is necessary to differentiate among oligomers and polymers in contrasting chemical classes because they may have very different function and behaviour in the soil. For example, compared with simple peptides and proteins, the presence of phosphorus and carbohydrate groups in phospho- and glyco-peptides drastically alters physico-chemical properties (e.g. charge and solubility) and by virtue of altering C:N:P ratios may also affect how molecules are metabolised (e.g. depending on whether microbes are C, N or P limited). This work was supported by a Future Fellowship from the Australian Research Council.